At some point in time you need 2 cribs for your twins. However, at the beginning you can let your twins share a crib. 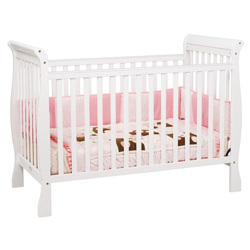 In that case you can get a Crib Spacer which will give each baby a little separation. However, it is not needed and your twins can enjoy each other’s company. 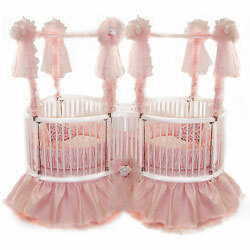 Meanwhile, with so many different styles of cribs in the market, it can be difficult to choose one. Of course safety and the price will affect your final decision. All cribs should have a certificate indicating that they meet safety standards set by the Juvenile Products Manufacture’s Association aka JPMS. Cribs should be sturdy. The distance between the crib bars should not be more than 2 3/8 of an inch. The crib should have at least 2 preferably 3 adjustable heights. 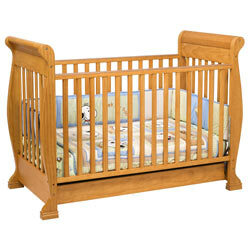 As babies grow and can stand in the crib you need to lower the base of your crib to the lowest adjustable level. There should be no cracks or breakages anywhere in the crib. The bottom of the crib where mattress sits can either be made of flat board or metal. Metallic ones are supposed to be more sturdy and are more expensive. The crib mattress should be a snug fit for the crib. You should be able to move the side railing easily with one hand preferably! At home try not to place the crib close to windows, any cords, or plugs. If you get an older crib from hand me downs or garage sales, make sure it is only a few years old. It should still meet the current safely standards. 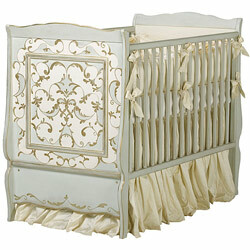 To save money, you may like to get convertible cribs that will grow with your babies and turn into toddler beds. According to Health Canada cribs made before September 1986 do not meet the current safety standards. We have both a Morigeau-lapine and one Storkcraft convertible. They are both good – except one costs 3 times more than the other!